Meshkini, S., Tafy, A., Tukmechi, A., Farhang-Pajuh, F. (2012). Effects of chitosan on hematological parameters and stress resistance in rainbow trout (Oncorhynchus mykiss). 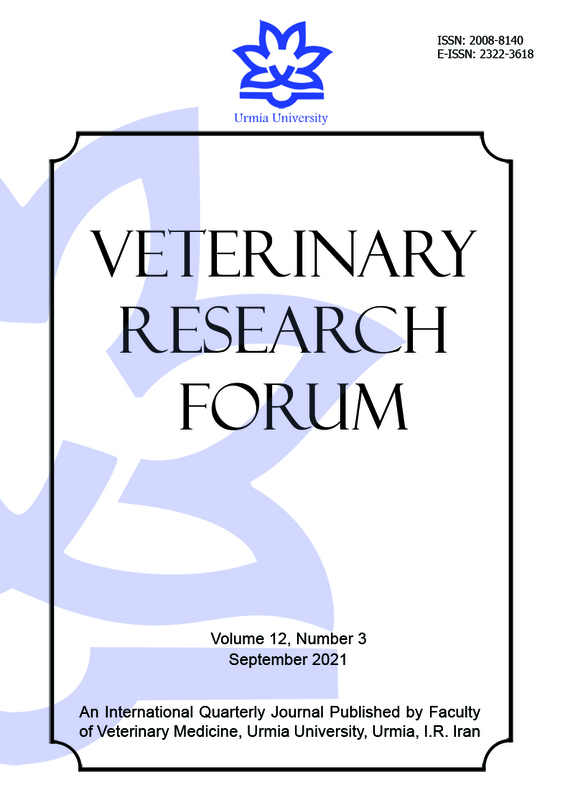 Veterinary Research Forum, 3(1), 49-54. Saeed Meshkini; Ali-Akbar Tafy; Amir Tukmechi; Farhad Farhang-Pajuh. "Effects of chitosan on hematological parameters and stress resistance in rainbow trout (Oncorhynchus mykiss)". Veterinary Research Forum, 3, 1, 2012, 49-54. Meshkini, S., Tafy, A., Tukmechi, A., Farhang-Pajuh, F. (2012). 'Effects of chitosan on hematological parameters and stress resistance in rainbow trout (Oncorhynchus mykiss)', Veterinary Research Forum, 3(1), pp. 49-54. Meshkini, S., Tafy, A., Tukmechi, A., Farhang-Pajuh, F. Effects of chitosan on hematological parameters and stress resistance in rainbow trout (Oncorhynchus mykiss). Veterinary Research Forum, 2012; 3(1): 49-54. The aim of our study was to evaluate the effects of chitosan as immune stimulator on some hematological parameters and stress resistance in rainbow trout. Nine hundred rainbow trout (with initial body weight of 25 ± 0.1 g) were obtained from a local farm and acclimated to the laboratory conditions for one week. After that fish were randomly divided into four groups in three replicates. Each group received chitosan in diet at four concentrations as 0 (Control), 0.25, 0.5 and 1 percent chitosan, respectively. The trial was conducted for 8 weeks then feeding with chitosan stopped for 3 weeks later and during this time all fish were feed by control diet. The sampling was conducted to assay the hematological parameters of all groups every two weeks. In this study we assayed the resistance of fish against some environmental stresses immediately after changing the diet to the control. The results showed that using 0.25 percent chitosan in trout diets had a significant effect (P < 0.05) on hematological indices and stress resistance of rainbow trout in comparison the control group. Serum glucose level was higher in all treatment than control without any significance difference (P < 0.05). Based on the obtained results it concluded that the adding chitosan at 0.25 percent into the diet could enhance the hematological parameters and resistance against some environmental stresses in rainbow trout.